Our first Faculty Spotlight shines bright on Dr. Janice Voltzow. 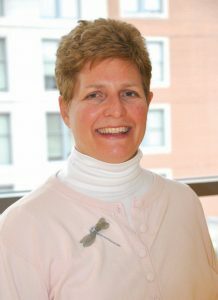 The first woman to be appointed as a full professor within the Biology Department at the University of Scranton and the first woman to be appointed as Chair of the Department, Dr. Voltzow has been breaking down barriers as she mentors young biologists, enriches the minds of students in the classroom, and continues to conduct research on exciting evolutionary-based concepts. Dr. Voltzow’s research is focused on understanding the relationship between structure and function in organisms and how that understanding can shed light on the evolution of these various organisms. 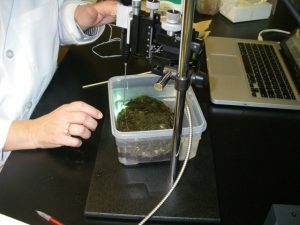 This knowledge can then be used to understand how organisms may be affected by current and future changes to the environment. 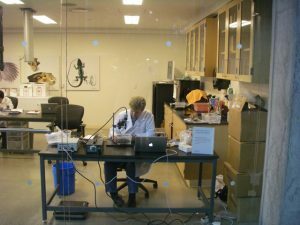 Currently, Dr. Voltzow’s research focuses on marine invertebrates and how these invertebrates will be affected by changes in temperature and water pH – changes brought on by climate change. Dr. Voltzow’s research has brought her to various corners of the earth – studying trees in tropical rain forests, tussocks in the Alaskan tundra, and sea urchins in Australia. One of Dr. Voltzow’s favorite moments during her research career occurred when she was able to explore the internal cavities of abalone with an endoscopic camera, all while working on the floor of the exhibit area within the California Academy of Sciences! As visitors to the California Academy of Sciences walked throughout the exhibit, they could observe Dr. Voltzow performing her research and they could ask her questions. This moment in Dr. Voltzow’s career combined aspects of research with teaching. Dr. Voltzow carefully explores the internal cavities of an abalone with a fragile endoscopic camera. Here at the University, one of Dr. Voltzow’s favorite classes to teach is Invertebrate Biology. This is not only because she gets to teach students about the invertebrates which she loves so dearly, but also because they get the opportunity to work with and learn from live animals which are shipped in weekly from Florida (which also happens to be Dr. Voltzow’s home state). Students taking Dr. Voltzow’s Invertebrate Biology get hands-on experience with these animals – what better way to learn about an organism! When Dr. Voltzow is not teaching or conducting research, she enjoys exploring the local parks and forests within the Scranton area. You may find her kayaking within Lackawanna State Park in the summer, or cross-country skiing through the woods in the cold winter. Along Dr. Voltzow’s travels throughout the world, she’s even gone for a swim in the Arctic Ocean, introduced the amazing sensation of disco dancing to Jamaica, and honeymooned in Nepal. While conducting research on abalone, Dr. Voltzow became part of the exhibit! Visitors could watch and ask questions at any time. Keep a lookout for Dr. Voltzow’s lab in the future. Currently, she and Laura Romanovich are working to extend Laura’s research which she conducted as an honors thesis last spring. Dr. Voltzow and Laura will be investigating the effects of bleaching in sea anemones to understand the complexities within this system and further our knowledge on the effects of climate change. With the assistance of several other interested students, they may make even faster progress in the search for answers. If these topics interest you, or if you are looking to brush up on your disco moves, make sure to pay Dr. Voltzow a visit. This entry was posted in Faculty Spotlight, Uncategorized. Bookmark the permalink.